The 4th of July is here, and you've got a house full of kids who can't wait to see fireworks. How do you keep them busy, active, and entertained until after dark? The key is creativity and planning. 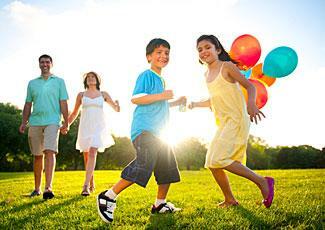 Try these fourth of July games and actvities for a fun-filled day. When you're planning games for a bunch of kids already excited to see a big event like fireworks, the key is to keep it simple. Give each team a list of items to collect. Items can be simple household items such as a button or a shoelace. Red items are worth five points, blue items are worth ten points, and white items are worth fifteen points. Anything that has all three colors in it is worth 20 points. Each team has a set amount of time to collect as many items as they can. Allow the teams to go throughout the neighborhood collecting items. When time is up, the teams come back and total their points. Have small prizes for the winners. Have a host of tweens and teens to entertain? Never fear, this manhunt-style game is the perfect way to cool off and have fun. The object of the game is to get your entire team to the other team's base without being seen or tagged. If you're the hunters, the object is to tag as many people as possible before they get to your base. To play, divide your group into two teams. Give the hunters a garbage bin full of water balloons. About 100 to 200 is ideal. Hunters can use the balloons to attack the opposing team. 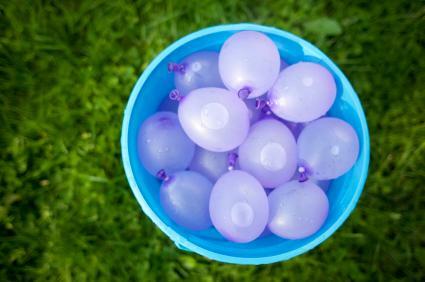 A hit from a water balloon equals a tag and that tagged player would have to join the hunting team. Taking a long weekend for the 4th of July? Make your trip a little easier by planning ahead with a 'seek 'n find' game. Give each kid a card of patriotic-themed words. Words on the list can include simple words like colors, or longer words such as former Presidents' last names. The kids will also need their own pencil so that as you travel, they can mark off each letter of each word as they see them. Whoever finishes first can light the first firework (if you're planning on doing them) or enjoy an extra treat at snack time. Add a little history into your 4th of July celebration. Rest assured, it doesn't have to be boring. Choose several historical figures from the Revolutionary War era and create a card for each one with two to three clues. As kids are waiting around for fireworks to start, challenge them to name as many figures as they can by drawing cards and trying to figure out who their person is. This is a fun and easy way to give kids something to look forward to throughout the day. 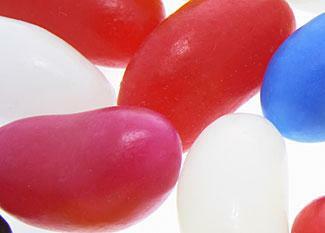 Fill a clear jar with red, white, and blue jelly beans (or any other candy.) As kids arrive for the big bash, have each one guess how many total jelly beans there are, and how many jelly beans there are of each color. When the kids get restless from waiting around for fireworks, use this fun game to keep the evening moving along. First, give everyone glow-in-the-dark bracelets. You'll also need a glow stick for each team to serve as the flag. Next, decide on a dividing boundary - if you have a large field, you may want to divide the field in half. However, Capture the Flag is typically played on uneven terrain. Next, each team decides on where to hide their glow sticks. The sticks cannot be buried, and they must be hidden on that team's side. The object of the game is for the opposing team to sneak into your territory and steal your flag, and bring it back to their territory without getting caught. If you tag someone on the opposite team trying to steal your flag, they are frozen on your side until someone comes to unfreeze them. While this might seem like a simple game of freeze tag, it actually requires quite a bit of strategy and teamwork to win. The person who possesses the Frisbee cannot run with it, and has ten seconds to complete a pass. If the Frisbee is intercepted or goes out of bounds, or the pass is incomplete, the defense takes possession of the Frisbee. A score is made when the Frisbee is passed and caught in the offense's end zone. To add a little patriotic fun, tell the teams that in order for their point to count, they have to name a former president. A variation on this is to tell the teams that they can double their points by naming a former president. Uncle Sam wants you. . .to dress up and run a wacky relay. This fun game is quick, easy and can involve whole families. To pull this off, you'll need to pull together a laundry basket full of patriotic-themed clothing for each team. You'll want to collect pants, shirts, and any unique accessories you can possibly find. Ideally, you'll want a complete outfit for each team. To begin, put all the clothing in a pile. Next explain to the teams that they are to run down to the pile and select an article of clothing until all of the articles are gone. This also makes a great fourth of July game for preschoolers. Then, with the pieces that they have, they need to dress up one team member. The team member must wear every single item collected to pull off a complete look. To signal that they are done, they'll need to sing a patriotic song. The team that wins is the one who has the best looking 'Ms./Mr. Patriotic Relay.' Judges can be creative, awarding points to those who use an item creatively or they can award points to whoever has the most complete costume. Have an adult pitch for both teams. Reduce the size of the baseball diamond. Use a softball or a whiffle ball. Let kids know that they need to hand tag rather than throw the ball to tag a player out. This fun, ongoing game can breathe life into a party when no one expects it. Buy a small stuffed 'Uncle Sam,' or any other similar patriotic toy. Tell children as they arrive that throughout the day, they should be on the lookout for 'Uncle Sam.' Hide him around the party area so that he may be spotted, but isn't really easy to find either. As a child finds 'Uncle Sam,' instruct him to shout that he's found the stuffed toy and bring it to you. Have some prizes for those who find him. You can rehide your 'Uncle Sam' when a child finds him just to keep up the fun. Challenge kids to come up with a croquet course. Let them use whatever they find, including sheets, lawn chairs, or even paper plate sculptures. The more creative they get, the better. Once the course is set up, set kids loose with mallets and croquet balls. 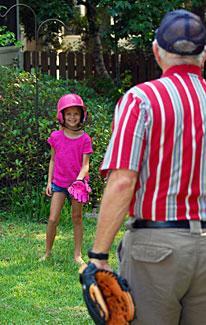 Have an adult keep an eye on kids with croquet mallets to make sure everyone stays safe and plays fairly. Traveling for the holidays? This game is a take on the old alphabet game that kids sometimes play in the car. To begin, each player gets a list of patriotic words. Make your words age-appropriate for your kids. They do not have to be hard words to be challenging to figure out. Each time a player sees a letter outside of the car while traveling, she can cross that letter off of her list. However, you must find the letters in order in the word that they appear. For example, if the word is FLAG, then the players must first find an 'f', then an 'l' and so on. "Chopped down a cherry tree." "Didn't want to be president." Of course the answer is "George Washington." The first player to blurt out the answer with only one clue read, gets two points. If two clues are read, the first person to blurt out the answer gets one point. If all three clues are read, the first person to blurt out the answer gets to read the next clue card. If you are reading the clues, and no one figures out the phrase, person, or item on the card, you earn two points. Blow up several balloons. Although only one balloon is in play at a time, you'll want to make sure that you have a supply for when the balloon in play pops. Mark off field goal targets. A balloon has to be within the designated field goal target to count as a score. Have all players on their knees. One player starts by passing the balloon to a teammate. The teammate then bats the balloon towards another teammate and so on until the balloon reaches the field goal target. If the balloon touches the ground or goes out of bounds, that is considered an incomplete pass, and the balloon then goes to the teammate from the opposite team nearest where the balloon touched the ground or went out. Play continues until one team reaches ten points or both teams agree to quit. Grab your most patriotic garb and don some colorful costumes for this fun game. Have a trunk of patriotic clothing and wearable paraphernalia. Feel free to be creative. You can use red, white or blue sheets, colored necklaces, wigs, etc. (Note that you can also ask guests to bring something from their closets on the invitation. Just make sure they don't care about the item too much before using it.) Split your group into teams, and challenge each team to create the most patriotic looking costume they can possibly create given the amount of time they have and the offerings you have. Give prizes for the best dressed, the most patriotic and the most hilarious costumes. As your evening winds down and it gets to be dusk, keep active kids busy with activities that will make waiting for fireworks seem like a short while. This simple activity is based on the scientific principle that water and oil don't mix. Have children use yellow or white oil pastels to draw fireworks on a piece of white paper. Using dark blue or black watercolors, have your child paint the piece of paper so it is entirely covered. Since the oil pastels won't mix with water, the fireworks will really 'pop' and make the whole scene seem almost as good as the real thing. If you do the artwork on postcard-sized card stock, you can use them later to thank people for coming to your party. This is a great project to do earlier in the day, and then to take out at night while kids are waiting for the big fireworks show to start. Take about a cup of hot water, and stir in Borax until the Borax won't dissolve anymore. It is okay if the solution is a little gritty on the bottom. You won't use that in the slime. Next make the glue solution by stirring 4-oz of glue into one cup of warm water. Now that you have two solutions, make slime by using one part Borax solution to three parts glue solution. Add Zinc sulfide or glow-in-the-dark paint to your slime. How much you add isn't crucial - add as much as you'd like to obtain the glow you're looking for. While you're waiting for it to get dark, store your slime in a Ziploc baggie. Paper bag luminaries are surprisingly easy to make, and can add a decorative touch to your front yard during the 4th of July season. To start, purchase paper bags at your local craft store in red, white and blue colors. You'll also need some sand to help weigh down the luminaries. 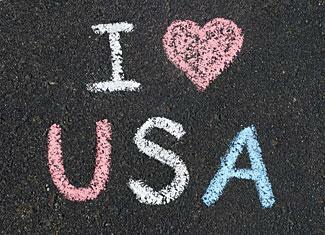 To start, let kids use stencils to draw stars, the flag, or fireworks on their paper bags. Have kids cut out the shapes. If you're worried about little hands not doing a good job cutting out shapes - use bigger shapes to make it easier. Fill each bag with one to two cups of sand, place a tealight candle inside, and light the path to your house! Making pizza is a great activity for kids since it's almost like edible play dough, and it's a fun fourth of Juy party food. To make things easier, purchase pre-made dough from the grocery store. This dough will need to be used within two to three days of buying it, so don't buy it too far in advance of the party. Set up your counter with bowls of pizza sauce, pepperoni, cheese, and any other toppings you can think of that your kids will enjoy. You can have the kids make pizza on a double-thickness of heavy-duty aluminum foil and bake them right in your oven. If you don't want to turn on your oven on a hot July day, try grilling your pizzas instead. Organizing a neighborhood parade is a lot of fun and can help bring neighbors together. To start, send out an invitation a few weeks before the big event. Tell participants to make floats using any ride-on toys that they have available. This could include scooters, tricycles, bicycles or anything else that you can think of that fits into that category. Families should decorate their float to represent the holiday. Before the parade starts, give each participant a line-up so they know when they are to ride, and enjoy the show. Mix 1/2 cup cold cream together with 2 tablespoons of cornstarch. You may need to add more cornstarch to get the cold cream to the desired consistency. Add a drop or two of food coloring. To make bold colors, you'll want to add food coloring until the shade is about two to three shades darker than you really want it to be. Use Q-tips or makeup applicators to apply the face paint. While it does take awhile to dry, it also will come off easily with some water. To make the sheet, you'll want to draw in pencil some outlines to follow. When you're ready to start painting, have your kids take off their shoes. Someone needs to paint the bottoms of feet in one color. To make stripes, have kids take baby steps across the sheet in a row. To make stars, have kids put one footprint in one direction and then put a second footprint crisscrossing the first print. It's very important to do one color at a time. If a flag seems like it might be too hard for your kids to create, you might want to stick with a simpler fireworks design where some stray footprints might be artful. Start with a paper square that is at least 4-in x 4-in big. Using a ruler, lightly draw a diagonal line from corner to corner, through the middle. Cut along the diagonal lines, just until you meet the circle. Taking each corner of your square, bring the corner to the center of the circle. Use a brad to fasten the corners to the middle and voila - a fun evening of entertainment. This is a simple 4th of July craft activity that keeps kids entertained for quite awhile. On a large piece of poster board, lightly draw an outline for a flag or any other simple scene they'd like to do. Using magazines, have kids cut up tiny pieces of red, white, and blue pictures. Using paint brushes and Elmer's school glue, paint glue onto the poster board in small sections, and use the tiny pieces of paper to create a one-of-kind American flag. It's okay if the papers aren't exactly red or blue - the effect is similar to when you see several different colored tiny dots that make up one larger picture. Let kids' imaginations run wild with a camera, and then preserve their memories in a laminated placemat. To start, give each kid a disposable camera, or they can share a digital one. Once kids are finished taking pictures, they can use a program like Paint to arrange them on a sheet. Have kids add whatever else they'd like to add to their placemat . Fun additions include speech bubbles by the pictures, jokes, or trivia. Print a color copy of the page and use a hot/cold laminator to laminate the page into a placemat. Put a cup of dry erase crayons on the table and turn mealtime into fun time. Carefully cover a large piece of poster board with clear packaging tape. Give kids dry erase markers in red and blue colors. It's an instant dry-erase board for some great fun. Try bringing your instant dry-erase board to your town's 4th of July parade. Let kids write messages to the parade participants as they pass by. Pulling taffy is one of those old-fashioned activities that never really gets boring. Delight your kids by letting them help you make homemade taffy for the 4th of July. Have kids stir ingredients until all the sugar is dissolved. Cook the taffy, without stirring, until it reaches between 260 to 270 degrees. The higher the temperature, the harder the candy will be in the end. As soon as the taffy reaches the right temperature, remove it from the heat and have the kids stir in 1/2-teaspoon of your choice of extract and a few drops of food coloring. Pour the syrup onto a cool, oiled work surface. A cookie sheet or cutting board works well. Let it sit for one minute. Use a metal spatula to fold the taffy in on itself until it is cool enough to handle. Be aware that taffy that is cool on the outside might be hot on the inside. Using well-oiled hands, let kids start pulling the candy. Have kids pull it out (don't let it break), and then fold it up, take up the new ends and pull it out again. Have kids continue twisting and pulling until the taffy becomes difficult to work with. Finally, use kitchen scissors to snip off pieces of taffy. Store in an airtight container. Take some time out from your celebration to thank a vet or a soldier. Set up a card table with paper, markers, stickers and anything else you'd like, and have kids write thank you letters to those who serve our country. Encourage kids to say why they are thankful for their freedom and send them to a soldier you know. If you don't personally know a soldier, you can send them to an organization such as A Million Thanks. 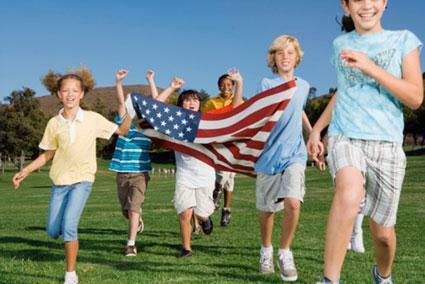 Incorporating 4th of July games for kids like these into the activities you do with your family will make the holiday even more fun, and can lead to family traditions that last for years. There are so many options for Indpendance Day fun, from backyard games to free fireworks games for kids online. If you're having a party, get other adults in on the action to make the planning a little easier.